If I had to pick a pet to compare this book to, I'd go with a hamster. It's only gonna last a few years and isn't that exciting on a day-to-day basis, but it's still better than nothing. 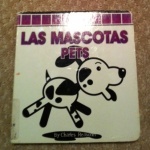 In truth, Las Mascotas is slightly worse than the rodent I'm likening it to, since I couldn't see myself getting the same joy from putting it on a pillow and snap-launching it into the air. Overall, I'd say Mr. Reasoner's work is only slightly better than the cellulose one would line a cage with, but since it's in Spanish and English, it's okay to leave out when company comes over.